There is no other Lady Gaga tribute act as accurate, as breathtaking and as talked about as multi-award winning Donna Lady Gaga tribute. This show is the Lady Gaga tribute that raises the benchmark for all other tribute acts. The show is a visually stunning and dramatic theatrical performance that recreates all of the drama, glitz and glamour of Lady Gaga’s most memorable performances. Donna as Lady Gaga is internationally acclaimed as the “Best Lady Gaga Tribute on the planet”! She recently beat off stiff competition from fellow nominees Sinitta, Gareth Gates, Joe McElderry and Sophie Ellis Bextor to win a prestigious GOSCAR award for the Best Act of 2010. And 2011 saw Donna set for more success with her sell out Lady Gaga tribute act show at the 1500 seated venue St David’s Hall, Cardiff, UK on the 2nd of June. Donna is the only Lady Gaga Impersonator and Tribute in the world that uses an authentic working replica of the Lady Gaga Spark (Pyro) Bra. All the costumes are professionally tailored handmade replicas of the Haus of Gaga wardrobe, designed and created by Donna and James Maciver (BBC Television and West end Theatre costume designer). The costumes cost thousands of pounds to make, but the attention to detail is noticeable with every single stitch, helping to re-create the experience of drama, attitude and fashion that is “Lady Gaga”. 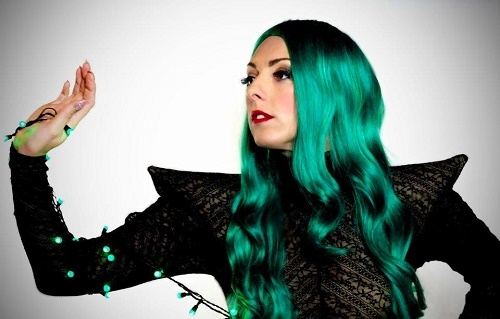 Donna has always made a lasting impact on her audience and is now internationally recognised as the world’s most authentic Lady Gaga tribute act and show. Her uncanny natural resemblance to Lady Gaga and convincing and realistic performances, have audiences asking themselves the question … who is the real Gaga? Donna won ITV’s Moon and Stars Talent Show series and has worked for many years as a successful female vocalist. She is no stranger to the stage and has worked with a number of top celebrities: Boyzone, Peter André, Ant and Dec, Urban Cookie Collective, Ultimate Kaos, Bobby Davro, Chris Goldfinger, Tim Westwood, Another Level, Hazel Dean, Angie Brown, Rozalla, The Saturdays, Inferno, Booty Luv, Steps and many more. Donna has performed to audiences of 30,000 and is renowned for her professionalism and positive attitude. Her motto that to be the best you have to work hard, is evident in everything she does – from the quality of her performances, her stunning costumes, props and choreographed dance routines. Lady Gaga Tribute performer Donna is comfortable on any stage and always captures the attention of her audience. She’s performed at Cardiff, Newcastle and Swansea Pride events on an annual basis (and will add Cornwall Pride to her portfolio this year). Donna’s Lady Gaga tribute act has also headlined GlastonBudget – Europe’s Premier Tribute Festival, Belfast Pride and Zurich Pride1. Donna is regularly featured in the media, with articles in Pick Me Up magazine, The Belfast Telegraph, South Wales Echo, and The Sun to name just a few. Donna has also featured on TV – including her win on BBC Moon And Stars talent show – and performed her Lady Gaga tribute act on BBC The Weakest Link’s December 2010 Tribute Special. Donna is also a qualified theatrical makeup artist. This an ultimate Lady Gaga tribute show experience. It has 100% all live vocals, up to 6 costume changes (all replicas of costumes worn by Lady Gaga from some of her most memorable performances), dance routines, Full on Gaga attitude, light/4 colour laser show, Monster ball tour intro & change music and so much more…. From her earlier songs such as Just dance & Poker face to her recent hit Alejandro, a Lady Gaga ride you’ll never forget! There is no other Lady gaga tribute that can come close to this show. This show is a production show and the whole hour runs from start to finish with no breaks. The show can be tailored to suit any event provided enough notice is given. If the venue should require a larger PA than 3K, then this will need to be provided. A quick dressing room will need to be provided within 10 metres of the stage) with a mirror, still bottled water and if possible red bull.